Heat oven to 350°F. Spray 1 1/2-quart casserole with nonstick cooking spray. Cook linguine to desired doneness as directed on package, adding broccoli during last minute of cooking time. Drain; return to saucepan. Meanwhile, in small saucepan, combine broth, half-and-half and flour; blend well. Cook over medium heat until mixture boils and thickens, stirring constantly. Stir in cream cheese, lemon juice and pepper. Cook over low heat until cream cheese is melted and mixture is smooth, stirring frequently. 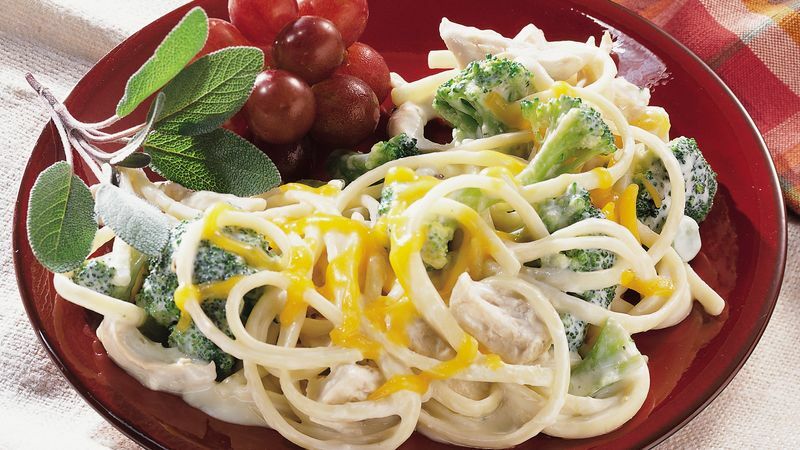 Add cream cheese mixture and chicken to cooked linguine and broccoli; mix well. Spoon into sprayed casserole. Sprinkle with Cheddar cheese. Bake at 350°F. for 25 to 30 minutes or until casserole is bubbly and thoroughly heated. Classic chicken Divan consists of chicken breasts and broccoli spears in a cream sauce. This casserole varies slightly from the traditional recipe; frozen broccoli and chicken pieces are combined with a two-cheese cream sauce. One 9-ounce package of refrigerated linguine can be used in place of the dried linguine. Use kitchen shears to snip the fresh noodles into short pieces. Cooked turkey can be used in place of the cooked chicken.